Neustar understands that your online security and infrastructure reliability has never been more important. 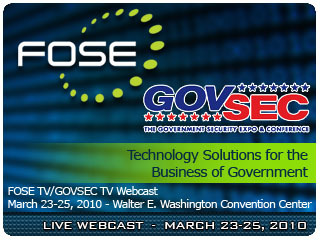 Visit us at FOSE 2010 to uncover the answers you need regarding DNSSEC and how your organization can leverage Neustar’s performance management services to manage all your service level agreements. Net Optics, the global leader in Intelligent Network Monitoring Access solutions provides 100% visibility of network traffic for performance monitoring and security applications to address the growing demands of mission-critical business applications for the government and public sector. Join Net Optics on 2/17 and 3/11 as Sharon Besser, VP of Technology shares how to implement a Monitoring Access Platform into the core fabric of the network. SmartDeploy Enterprise simplifies deployment of Windows workstations and servers lowering hardware and software TCO. It helps organizations of all sizes accelerate deployment, reduce risk, and increase security. Using SmartDeploy allows you to save time while supporting more device types; simplify tasks with a wizard-driven interface; and save money with per-technician licensing. SoBran’s Engineering & Logistics Services Division builds innovative responses to complex engineering, logistics, homeland security, anti-terrorism, infrastructure and environmental challenges. Faronics makes it possible to do more with less by maximizing the value of existing technology. Our solutions deliver total workstation reliability, complete system control and non-disruptive computer energy management. Incorporated in 1996, Faronics has offices in the USA, Canada and the UK, as well as a global network of channel partners. Our solutions are deployed in over 150 countries worldwide, and are helping more than 30,000 organizations.